From 1982 — when STS was created under the leadership of our Schuylkill County Commissioners — to now, we have never forgotten that a dependable public transit system is a vital component in the quality of life for the people in our community. We are committed to the task of providing the very finest in public transit services to the residents of our county. Our original fixed bus routes have expanded from five to ten. In 1982 the average bus in the system was more than fifteen years old. Today our average bus is less than five years old. In May, 1988 we dedicated the maintenance and administrative facility pictured below. Our objective was to enhance our ability to maintain a world-class transit system that would be able to serve Schuylkill County with distinction, well into the 21st century. Schuylkill Transportation System maintenance and administrative facility. 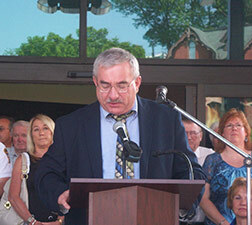 In 2011, Union Station opened to provide Schuylkill County Residents with transportation service located at 300 S. Centre St., Pottsville, PA.
Mr. Mike Micko, Former Executive Director of the Schuylkill County Transportation Authority, addresses guests who attended the June 2011 dedication of Union Station. Union Station building from Centre Street level. In operation since June of 2011. Many milestones. Many challenges overcome. And doubtlessly more challenges in store. Rest assured, we’ll be here to get you there for many years to come.